The designers are busy searching for new ideas and new and unique designs for almost everything. It is big task for them as the consumers are also demanding for new ideas and the competition is growing too. They have to satisfy all the classes in the society. In this fast growing era sometimes the old ones are left behind. Here, in the making of the Cathay PK-24, the designers have tried to satisfy that special class in the society where not only the old ones but those who love old ideas rapped in new items too are there. In this era of iPods, very few of us like to enjoy music while the system is kept flat and where you can listen to your old collection of CDs. The Cathay PK-24 is a stereo system, which can be kept on your desktop, as it is small in size. 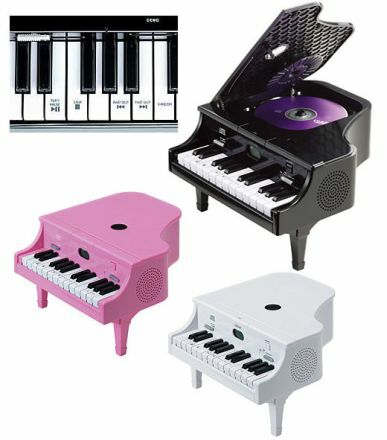 It looks like a mini piano and on the first look you will think it to be a toy or something like that. But when you will open the top lid, you will find a CD player inside that. It is so beautifully designed that you will be surprised at each step. You will be wondering how to start it and will find that the playback controls are hidden behind the keys of the piano and the sound comes from the sides of it. The speakers are inside the piano and the sound output is from the sides. This is not all; you have FM radio built in it. Just for those moments when you feel like hearing to some different music other than your collection. This CD player is full of surprises and is unique in its design, which will attract you even if you are young or a little old. Chinese logic – Hunter being hunted!